Pulling the Head Back - Light in the Hands? Pulling the Head Back - Heavy in the Hands? Bottom Thick, Top Thin - Top Thick, Bottom Thin? To address the outline of the horse from the front is like painting a loaf of dough brown to make it baked. It is simply going about it the wrong way. It's trying to mimic the finished results by adding it's appearance, not by developing it's prerequisites. The rein aids are a fact in dressage, there is no way around that. 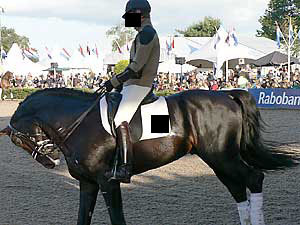 Some of the more sterner "purists" hardly acknowledge that the hands have any role at all to play in dressage, but renouncing rein aids is, of course, equally wrong. Relaxing the jaw, positioning to the inside, bending, etc is all done with the aids of the hands. So it's not about that. 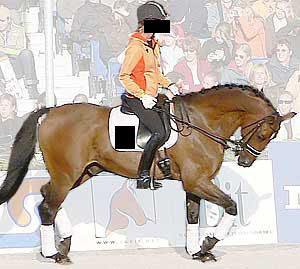 The 'Progressive training of the Dressage Horse' in 2005. It is about the way the horse works. Energy, rhythm, balance and collection are generated in the quarters. The quality of the work of the quarters influences the quality of work of the whole horse. The influence of the rest of the horse on the quarters is literally non-existent, unless the horse is working correctly behind to start with. So training should start with, and continue to concern the quality of work of the hindquarters. Without that, one can bend and twist, stretch and loosen every part of the horse, and the quality of movement will still not improve. Most proficient rollkur riders know that. That is why they extend the trot and canter explosively forward, frequently, and also the reason for rushing around in medium trot working to get "active hindquarters". Since the horse has to contract his underneck muscles in this work, and since the attention goes backwards to the chest or between the knees, these horses have to be chased forward for them to become active behind. A horse shows his inferiority to another horse by lowering his head. The lower the head the more submission. It also works the other way around; if you lower the head of the horse he feels inferior. It can be a way of managing the relation between horse and rider. It can also be a way of robbing the horse of his pride, depending upon the extent to which it is done. The horse is very dependent on being able to adjust the head to focus his eye-sight at different depths. A horse that looks for something at the horizon lifts the nose to almost horizontal level, and looks along the back of his nose. When a horse focuses on something close, he changes the angle to approach the vertical, and looks at it straight out in front. 90 degrees to his nose. forward, down & out on the vertical. held in behind the vertical. When the horse is made to hold his head well behind the vertical in deep or rollkur, this means that he, at the most, sees the ground immediately before his feet, in focus. You can clearly see that on showjumpers approaching a fence with the neck curled in. As the rider finally lets the horse up, he realises there's a fence ahead. Ears point forward and he seeks the fence. If the rider were to keep the horse curled in, the odds are that the horse would not clear the fence because he cannot see it and because it restricts his freedom of movement. There is much talk about riding forward when riding deep. The trouble is that the horse cannot see forward, and therefore has trouble thinking forward. Normal curvature of the spine in a horse with the neck in a natural position. The shape of the neck is what is most visibly affected by riding the horse deep and rolled in since it is used as a tool for bending up the heavy back and/or off-setting the horse's balance. The neck is very agile and most horses can bite their own chest, flank or rump if they make an effort. The vertebrae in the neck do not have the spinous processes that do those of the chest and back. and they work a bit like a chain, being very mobile in most directions. The muscles attach directly onto the vertebral bodies. Generally you can say that a horse showing a lot of underneck has a lower set base of the neck, spine-wise. It usually also has generous muscle bulk on the underside, but the two go hand in hand. If the horse has weak muscles supporting the base of the neck from above, it sags. The muscles from withers to poll take over, and the underneck stabilises and stops the bulging bottom from protruding too much. Increasing curvature of the lower curve of the spine - horse above the bit. The greater bow of the S-curve at the bottom makes the neck shorten. 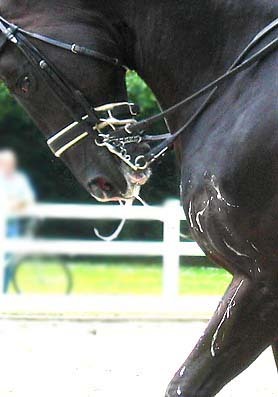 In dressage there is much attention paid to the "arching" of the neck. But this is not an arch that one would want to increase, rather the opposite. The vertebral column of the neck should rather straighten than curve - the telescoping neck. It is the outside of the neck that arches in appearance. The bottom curve of the vertebral column lifts and straightens, the top part stays about the same, and between the very top vertebra and the skull, full relaxation of the muscles lets the head fall into place. The muscles around and in front of the withers help lifting the base of the neck, while they in their turn are aided by an active back. from correct work and selfcarriage. In this way the shape of the neck is a good indication of how well the horse uses his back. 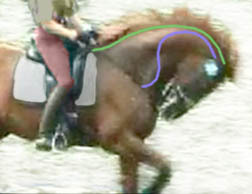 The aim is to have the horse do this "topline stretch" both over the back and over the neck. Now, I wrote tendency. It does not mean that the young horse should be ridden with his nose at the ground grubbing like a hog. No, a tendency for forward-down-out. The horse shall seek to stretch out but not actually do so. Rather contact the bit and stay there. The mere tendency makes this mechanism of lifting the base of the neck work. To begin with, there's little, but the stronger and more well trained the horse gets, the better the effect. The topline muscles of the neck work at their medium length, and the muscles at the underside are disengaged. The head falls relaxed from the 1st vertebra and needs no fixing by muscles, but simply hangs by it's own weight. In his studies, he found that 80% of horses used for dressage and jumping had injuries around the attachment of the nuchal cord on the head. Horses used for hacking, trotters, ponies, coldbloods, had these injuries much less or not at all. The injuries consisted of bony build-up on the site of the insertion at the back of the skull, bony nodules inside the ligament, mineralization of the ligament, etc. These are all the inevital result of excessive stress and inflamation, because the body tries to reinforce and area threatened by rupture. 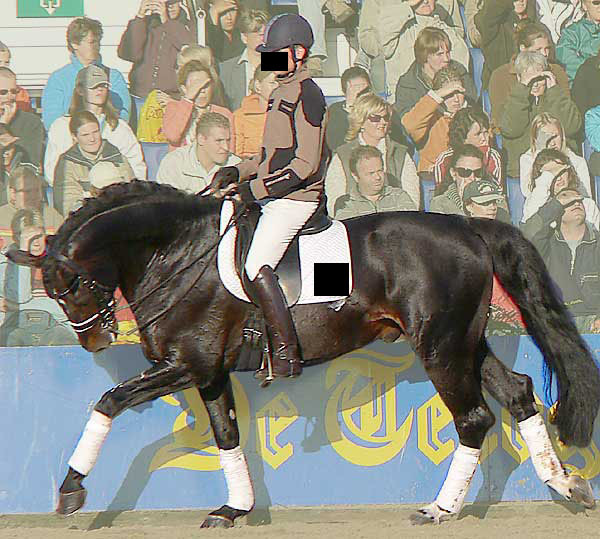 In an article in Dutch magazine Bit in 2003 Het Knikje - Overbelasting van de nekpees, Weiler's answer to the question of what causes the overloading comes as rather a shock for dressage riders - It occurs when the horse makes the highly sought flexion in the poll in dressage training. Overbending, riding deep and round, or with the chin almost on the chest or behind the perpendicular is the cause of the problems, according to him. These particular types of injuries are caused by a pulling, shering, torquing or twisting stress on the ligament insertions. Now, remember that all horses graze, and they do it with their noses "on the ground". But non-dressage/jumper horses had normal x-rays and skulls. Those horses graze too, so just stretching the head down is apparently not harmful. The sheering action on the ligament probably happens as the riders impose extreme poll flexion, curl their horses noses into the chest, and work them there repeatedly, for lengthy periods of time, or pull hard while doing so. For further reading, see Dutch magazine Bit, July 2003, issue 98. Imagine the stress put on this relatively small rope-like structure and its insertion at the back of the skull, if it were to pull the weight of the back and the rider up. It's 3-4,5 cm thick at the insertion, and tapers off to 1,5-2 cm just 2 inches later. It just wasn't made to work that way. The really alarming part of Dr Weiler's study is that the absolute majority of horses that were used for the study had not been clinically diagnosed as having problems at the poll specifically. Still, they appeared to have quite severe ossification at the insertion, sometimes sticking out 2-3 cm! See below. Added bony growth at the insertion area of the back of the skull. This kind of repeated injury does usually not show up as lameness or pain upon palpation, since few people palpate (press with the fingers) the horse at the poll. It is also obviously a slow, low intensity degeneration of the insertion area, with what one can suspect is a dull constant ache, like in arthritis and spondylitis of the back in humans. It thus goes unnoticed, or emerges as unwillingness, head shaking, stiffness, mis-behaviour, or the like, and is never treated as what it is, the training is never re-evaluated and the horse just learns to deal with it. Often, dull inflamatory pain is temporarily relieved by physical activity and activity induced endorphins release in the body. Like all other faulty training, the endorphins take the edge off the pain that comes from resistance, over-exertion, tension, etc. But it shows up in the horse's reluctance to let go during the next training session. Many highly trained horses take forever to warm up, because one has to work out all the small resistances that the horse has come up with in self-defence, to stop pain or break-down. "Consider three points: The first is the attachment of the nuchal ligament to the base of the horse�s skull just below the ears. Below that is the atlanto-occipital joint where the last cervical vertebra meets the skull. Third are the bars of the mouth where the bit rests. 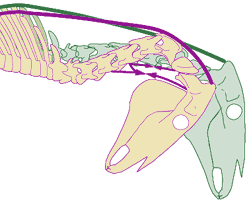 If you examine these three points closely, you will see that they, just like the head and the neck, follow the lever principle as well: This means that if you have 40 pounds in your hands, for example, these 40 pounds create a multiple of applied (compressive) force at the point where the nuchal ligament is attached to the horse�s skull. Now you will also understand why permanent influence of this kind causes damage at that point." "From a physiotherapist's point of view, deep and round is DANGEROUS, especially for younger horses in training. In this position, the horse's nuchal ligament becomes over-stressed quickly (in under 1 minute! ), quickly resulting in tearing of the tissue. The nuchal ligament is a fibrous, inelastic tissue which is easily damaged and hard or impossible to repair. Chronic problems often plague horses with this injury." Setting the head deep to put traction on the nuchal ligament to "raise the back" actually only does half the job. It raises the thoracial spine by pulling on the tall vertebral spinous processes. The nuchal ligament also pulls on the supraspinous ligament that runs along the thoracial and lumbar spine. As this is tightened, the last lumbar vertebrae is actually pulled up in relation to the middle thoracial vertebrae. In a horse trained to pull his withers forward to raise the back or to whatever, really, you have a constant traction and subsequent locking of the lumbar back. This because the head is constantly down, and not just pulling on the ligament with each step in a pulsating wave like way. Many of these horses thus show stacatto breathing and a tense drawn-up belly, because the effect has to be strongly counteracted by the abdominals. The lumbar back is locked sway by the extreme curl of the neck. If you work to do the same thing, but use the unencumbered muscle force created behind (from engagement of the hindlegs and collection), you will get an intermediate, pulsating intermittent lift with every step of the hindlegs. The horse will not need to counteract anything except the weight of the viscera and the rider. The massive muscles of the pelvis, croup and thighs are much more effective in this quite heavy task. Also, they do not cause a stiff underline-upperline tug of war. The neck is certainly used, but only to pull at the withers and raise the neck, a more appropriate burden for this part of the body. The underneck muscles are idle as they should be. The lumbar back arched by the tucking of the croup from behind. "Exessive lowering of the head can stiffen the back. What seems at first to be roundness, turns into a lock, which seizes the lumbo-sacral area and prevents a coiling under of the pelvis." * Forward traction on the nuchal ligament which places the supraspinous ligament under tension, causing the lumbar area to lock; This locking increases the work of the abdominal muscles and necessitates the compensatory action by the lumbo-sacral and coxo-femoral joints." Massage and Physiotherapy for the Horse by Denoix/Pailloux. This does in fact say that the very part of the back that we want to round with this method, is the one who is locked in extension. The thoracial spine, the joint between the sacrum and lumbar spine and the hip, will have to compensate for this partial hollowing of the lumbar spine. The way we train, is usually the way in which we perform the skill later - If the horse learns to do shoulder-in or passage with an extended lumbar back, he most probably will, during the test, too. Philippe Karl has a very valid point in one of his videos (Classical Dressage - The School of Gymnastics by Philippe Karl). All these dressage riders are so concerned with the back, and to stretch it, and round it, but they don't jump. The jumping arch is the most useful arch of the entire horse you can accomplish. And it demands engaged hindlegs. Why don't they jump? At least small obastacles? And also, when a horse jumps and arches the most he can, his neck is always arched out and the nose is always in front of the vertical. It's the nature of real arching. Stretching muscles under tension - Ballistic! Those in favour of the deep method like to think/talk of it as a stretch. Stretching is a positive word, in this day and age. Stretching has proved to be beneficial for both improving athletic results and preventing unsoundness, and has been developed to its advanced form quite recently. In the aspect of stretching muscles for athletic improvement, humans, horses, cats and dogs are the same. The sport horse is a large muscular animal with enormous athletic potential. Dressage, both as a means of training, and showing of said training in the test, demands the utmost of the animal. Not only muscular strength, but also suppleness, balance, agility, co-ordination, proprioception and grace. A horse with tense, shortened muscles, muscular imbalance, or even worse, pain or injury cannot do his best in training or testing. And one of the most basic and effective therapies for tension, cramp, imbalance and poor proprioception is stretching. Lunged tied in deep and in extension. Flexing energetically left and right in medium paces. And when it comes to stretching, advances are much greater in human therapy than in that of horses. And all knowledgeable therapists and researchers warn strongly against ballistic stretching exercises for example, frontline physiotherapists Olaf Evjenth & Jern Hamberg in their book Autostretching. "This type of stretching (ballistic) is not considered useful and can lead to injury. It does not allow your muscles to adjust to, and relax in, the stretched position. It may instead cause them to tighten up by repeatedly activating the stretch reflex." Extreme over-flexion in medium paces. Ballistic stretching is done under active shortening tension of the muscle to be stretched, with momentum or considerable torque/force. And the muscle reacts to what it sees as danger of injury, and cramps. This is a natural and good reflex. If a joint is about to dislocate, areaction such as this from a muscle controlling the joint can save the life of the whole animal. An unfit, tense muscle is better than a dislocated joint or torn muscle when it comes to saving ones life by outrunning a predator. The horse will do anything to stay intact, even if it means lifelong pain. If the muscle is contracted and stretched at the same time, ballistic stretching, the zones will not glide apart. The muscle is very strong and fights the pull. What gets stretched out and elongated, sometimes permanently, are the tendons at the ends of the muscle, and the tendinous non-stretchy zones of the muscle, that are supposed to give the muscle tonus. The range of movement of the bones may increase, but the gymnastic range of the muscle lessens. To keep tonus the muscle has to shorten slightly. In this state the muscle never relaxes to neutral, and thus loses it's ability to contract powerfully. For a beneficial and useful stretch the muscle needs to be relaxed - idle. Stretching should be measured and controlled, and certainly released at any sign of resistance or distress. In the horse this is best done at standstill and without rider. The horse is in control of his own balance and can abort at any time, for any reason. The muscle being stretched is unloaded and can relax confidently. No educated human would ever run around with a filled back pack on and stretch ballistically in positions that compromise balance. Well, they used to in the 40's and 50's but only the sturdiest of athletes could take that kind of abuse. During ridden propulsion the back of the horse is under load both from the pushing hindquarters and the human load. The back muscles are then ballistically stretched with a load on top, and extra intermittent snatches at each step. The neck muscles are under load from having to hold the head back and up instead of relaxing it towards the ground, and is stretched loaded. The gross bendings of the neck to the sides just add insult to injury. The neck muscles are stretched in their tendons and tendinous zones and thus slackened and rendered useless in supporting the spine and head. The stretched out back sags because of lack of tone. In the "up" position some horses show partial sloppiness because of lack of tone, partial tension because of a need to stabilise their frame and make up for natural tone. The fact that these horses are mostly trained in the "artificial tonus" of the deep frame saves them from breaking down from wear due to lack of tone. At the end of each short training session, after a demanding exercise or simply at even intervals (every 2-5 min at the very least) you let the reins slip slowly out of your hands, the horse should follow the bit down to a full stretch/relaxation. This is to let the muscles "jog" at low tension to transport away metabolic by-products that would otherwise cause pain and resistance. It is amazing how little resistance one meets in a horse after he has learned that he will always be allowed to stretch out and RELAX after each effort. Relaxing out long and low. A good thing is to learn this at walk first, since the risk of losing balance is lesser then. See The Shoulder-In Volte. If you have a horse that has been schooled to work in a hollow outline or creep behind the bit/aids and who does not want to take contact with the bit, you can train him to step in under his mass with the hindlegs, stretch the back and telescope the neck into contact, and do it from the ground. The added bonus for the horse is that he does not need to carry you on his back while learning this, and the bonus for you is that you can see what the horse does. After this has been understood by the horse, it can be done from the saddle, to help the horse feel how he can relax the back and neck and still carry the weight of the rider. Even how the rider becomes more comfortable to carry. See The Shoulder-In Volte. When a horse relaxes into a full stretch, you'd want it to stretch the neck as long and straight as possible using gravity. Since the weight of the head and neck stretches the neck towards the ground, all the muscles of the neck and jowl can relax and acid build-up can rinse away. The S-shape of the vertebral column is straightened and the neck becomes longer. It is now easier for the horse to go back to lifting the base of the neck correctly, and arching out of the withers, compared to if fatigue and acid build-up had impaired the muscle sling, and let the horse sag the base of the neck down to curl behind the bit. Curling of the cervical spine in rollkur. If instead you'd force the horse to curl his neck up, the S-curve is exaggerated and the neck is shortened. The nuchal ligament (PINK) along the top of the neck is like a rubberband tendon from poll to withers (and continuing along the top of the spine over the back). This tendon can only stretch so far. When the neck is curled the nuchal ligament is stretched and resists. It limits the rolling of the neck. So the spine inside this limitation folds up in an exaggerated S-shape. 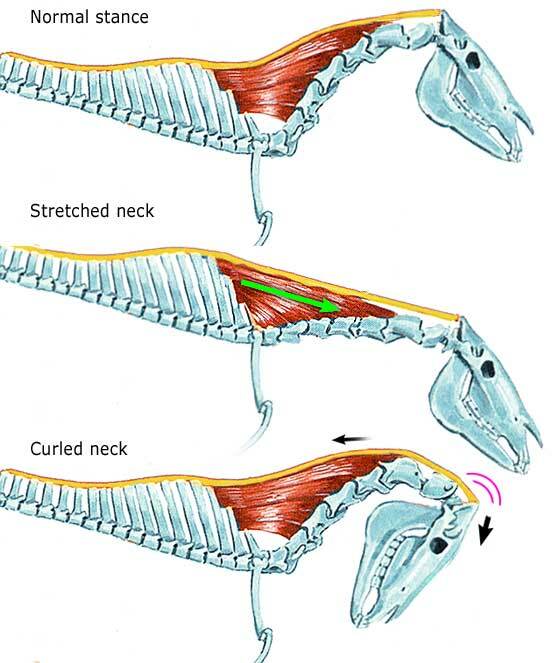 The muscles used to pull the head back (GREEN) go from the jaw to the middle of the spine. Just as much as they pull on the head to move back, they pull on the spine to bulge forward. Using the underline neck muscles to pull the chin in. Now, the head hangs from the first vertebra of the neck like a chandelier from a hook in the ceiling. Gravity wants it to fall down, but its attachment to the neck makes it hang up there. Gravity works straight down towards the center of the earth. The attachment is at the front of the skull (believe it or not). The nose of the horse is lighter than the jaw because of the sinuses, and the relaxed tonus of the numerous muscles of the poll (to help poke the nose) all help keeping the nose slightly if front of the vertical, in this state of total relaxation. So to pull the nose of the horse back behind the vertical, we need to fight both gravity and muscle tonus. Now, make an experiment. Experiment with a bag of books. Let's say that the head weighs 50 pounds on a warmblood. And this head is pulled back to a 45 degree angle behind the vertical, that means 25 pounds of force holds the head back and 25 pounds of force is left pulling down (gravity). Now, take any big bag you might have. Load it with books weighing about 50 pounds (lots of books). Hang it on a hook somewhere. Take hold of a snip of the bag, and pull it out to a 45 degree angle. Your hand now holds half the weight of the bag. When a horse pulls his head back by virtue of the small muscles of the underneck and jowl, this is the force he needs to employ. Now, put in perspective that these muscles are naturally only used for swallowing, neighing and ripping of grass at pasture. 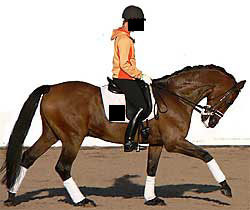 They should be relaxed and idle in correct dressage training, ot they WILL shorten the neck. This is what happens in a horse that is 45 degrees behind the vertical and light in the hands. If he is heavy in the hands, you are holding the weight of the head and the support base is the surface of the bit across the tongue and bars. In that case, you are also likely shortening the neck by the pull of the hands. Underline muscles of the neck. "A system of muscles (Longus colli going from vertebrae to vertebrae, my addition) spans the underside of the neck vertebrae, again protection the area of the 1st rib by extending under the thoracic vertebrae into the ribcage. In conjunction with the sternomandibularis which connects the sternum to the bottom jaw, they flex and pull the head towards the chest. However, long muscles also connect the sternum to the bone at the base of the tongue. When the horse's head is tied in (held deep behind the vertical by his own muscles, my addition), he is virtually unable to swallow. This makes the action of the bit rather uncomfortable, and presumably defeats the object of enforcing a particular head carriage on the horse." tension in the underline muscles. The drooling that one sees on many deep or forcefully ridden horses comes from this fact. The pull stiffens the tongue, and the effect of the bit, especially when heavy or harsh, makes it worse. The pull on the jaw causes the horse to clench the jaw, stiffening further. A tight noseband can be and is frequently used to hide this. But the fact remains that the horse will use his tongue as an eggbeater in side his mouth, to try to escape the pain and cramp caused by the bit and the sternohyoid. This is why these horses foam and drool profusely. Their open lips sometimes leave strings of saliva in the arena, an certainly over their own frontlegs. A moist mouth with some white lipstick is a good thing. One often observes it in retrained horses that start to work the right way - one change is that their mouths soften and become wet. But when the wetness is whipped into a stiff foam, the tongue is too active, and the mouth is gaping open, from nervousness, cramp or pain. Rider manually pulling the horse's head back. If the horse does not hold his head back and up himself, with the muscles of the underneck, that means that the rider must pull the head back with the reins. If the reins attach to a snaffle bit in the horse's mouth, the two joined mouth pieces of the bit will fold around the lower jaw of the horse and squeeze it like a nutcracker. Try putting a snaffle bit around your lower arm and pull on the rings with the same force you pulled on the bag with - 25 lb. And this is the horse's gums we're talking about. Ouch! That was the snaffle, but what about the double bridle? Dr Klimke had his own method of warming up. Even before a show, you could see him stretching his horses in long and low in the snaffle. He thought the double had no place in letting the horse stretch down long and low. Then he'd change to the double and ride the test. The celebrities riding deep do so in the double bridle. It is part of the regular training session, so a change of gear is not necessary. Now, you tried the snaffle on your arm - why not try the curb..? The curb has lever action and a straight mouth bar. The jaw/your arm is squeezed between the mouth bar and the curb chain. So in combination with the bradoon you get both nutcracker and lever action squeeze. Hand position is very revealing when it comes to weight in the reins. "Hands should be held above the withers about a hands breadth apart and upright." When a horse is curled in and the rider carries the weight of his head in the hands, only Arnold Schwartzenegger will be able to hold his hands a hands breadth apart and upright. When that much weight pulls on the hand the underarm/hand/rein angle straightens and the hands are suddenly 3-4 hands breadths apart, and knuckles up. horse hanging on the reins. When a horse carries his own head, and the weight in the reins is the weight of the rein itself, holding the hands close together and thumbs up is a breeze. The more pull, the straighter and flatter the hand. Dr Clayton recently tested the biomechanics of the half-halt and general rein contact in her lab. Sensors were attached between the bit and the reins to measure the pull on the reins. Clayton found that the "average horse" likes to put 5 lb or so into each rein. So you wonder how the masters could say that you should carry the weight of the rein in the hands. Was that an understatement? Then you see the actual photo published in Dressage Today of Dr Clayton riding her 3rd level arabian Magic with those 5 lb of pressure in the reins. And again you realise that the data used for this kind of research is not fine traditional dressage, as has been handed down to us by the masters, but mainstream competitive riding with a horse behind the vertical leaning on the rider's hands. It is certainly true that any horse put in such a position will put about 5 pounds of tension into each rein. But that does not make it correct. Again, flawed data. In rollkur, the upper part of the vertebral column is severely overflexed and under strain. Since there are only 7 cervical vertebrae the angles between the vertebral bodies in this part of the neck are as far away from their natural position as possible. To some extent, this is OK. The neck is agile and meant to be able to take this position. But working in this position, where the muscles and ligaments between the vertebrae are stretched to their limit, dulls the tone of these muscles and elongates the ligaments, ridding the neck of all natural tone. Thus the dishrag necks we see in these horses in the arena. Also, the friction between the vertebrae facing each other at such odd angles is greater, and with the pressure of the nuchal ligament and the underline muscles compacting the neck, the spine is subject to wear and tear. This kind of training sets odd muscles on the neck of the horse. Naturally, since the neck is held and trained in an odd way. The gross bending of the top of the vertebral column results in an overstretching of the splenius musculature of the neck. The splenius is a triangular muscle that supports a large part of the vertebral column from the withers. When the horse is asked to work with his neck vertebrae misaligned, as in holding the poll low and the 2nd-3rd vertebrae the highest point, the muscle has to partially stretch and partially shorten. Also the insertion at the skull and the origo at the withers line up across the vertebral column and so the muscle narrows and as it stretches between the withers and the poll the muscle glides down on the side of the neck, reinforcing the break in alignment at the 3rd vertebra. The muscle is stretched out across the angled vertebrae and made to work in utmost extension instead of supporting the vertebral column from above. This can easily be seen from the outside as a distinct bulge in the area of the axis, that is 2nd and 3rd vertebrae. The smaller muscles of the poll and atlas vertebra are also fully extended and work under stress. So the horse bulks up around the top of the neck/poll. These muscles are not very strong, however, since they have been so stretched out in their work. They don't stabilise the head with their tone, because they have no tone. So the head flaps along with the rein aids or with the thumps of the gaits. In correct training, the muscles in front of the withers become firm and strong, and grow in size. This is because they support the base of the neck from above. They pull on the spinous processes of the spine/scapula and the last vertebrae of the neck at medium length. These muscles are all that can support the weight of the neck, since the longer muscles of the neck (those from withers to poll) have been relaxed through softening the poll. In rollkured horses you sometimes see a marked grove in front of the withers. The edge between scapula and neck is sharp. The neck is thin in front of the withers. This is because the horse does not use the correct muscles. spine / shortening of the neck. A rolled up neck shortens the nuchal ligament, and when the neck is curled the horse can hang his head and neck from the ligament. The ligament goes from withers to poll and the base of the neck sags. This becomes extra evident when the horse is then ridden "up". The neck bulges at the base, and overflexes at the top. Much like a teapot beak. The splenius muscle mediates between the angle of the head, traction of the nuchal ligamentforward reach of the forelimb and the position of the neck bones. In other words, splenius is the barometer of selfcarriage. 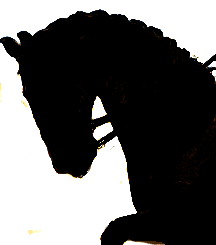 Correct work, or incorrect ditto, reveals itself in the shape of the neck when the horse when he is left to his own devices. There are many signs of correct work, and some horses have these more or less naturally, without correct work, and some will have a harder time developing "the look". Seen from the side, the topline of the neck should be rounded, or at least straight, not concave. The rounding should be even and smooth, with no nasty break at the 3rd vertebra. The topline should be continuous from the withers to the ears, and show no indentation in front of the withers or in front of the 1st vertebra. In horses with big withers and a low set neck, this is of course harder to accomplish, and takes longer time. The lack of muscling along the topline can easily be masked by letting the horse gain weight. Many lower level warmbloods are kept generously overweight because their toplines look so good. "He is so muscular, he craves that much feed" says person responsible for stuffing live animals. Stallions have a hormonal advantage and crest up beautifully, too, but that's also fat. The underline of the neck should have a defined gullet from jowl to shoulder. If you hold the hand around the underside it should be soft and sloppy and reasonably thin even down at the base of the neck. You should be able to feel the airpipe easily. The grove must not be filled out with underline muscles, nor pushed out by the bulging of the spinal column. The line must must be concave, or at least straight. A convex line is really bad. Imagined from a cross section point of view, the part of the neck situated above the spinal column should have large muscle mass, especially close to the withers. A cross section of the neck at the 5th or 6th vertebra should look more like an old-fashioned key hole than a pear. Closer to the head, the neck should slim evenly, and be flat-sided. No bulge in the area of the 3rd vertebra, and no break in the topline or on the sides. Between the 1st vertebra and the head the connection should be smooth and seamless. No "knuckle" of the 1st vertebra sticking out upwards, since that is a sign of lengthy overflexing. The jowl should be fine cut and the throat clearly visible. Any puffy swelling behind the rim of the jaw speaks of squeezed spit glands because of overflexion at the top of the neck. Partoid glands pushed out by pressing the jaw against the neck. The parotid glands incase the parotidoauricular muscle which is attached at the frontal base of the ear. The cause of the over developement of this muscle, and thus the over compression of the glands, is excess rearward traction and compression from the rider. 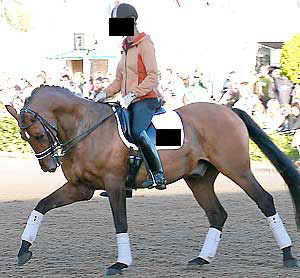 Dressage horses that are not subjected to overbending and strong backward traction on the reins do not develop the "swollen" muscle and protruding glands. Many writers and trainers warn against buying horses with narrow spaces for the partiods. This is however 99% of the times a riding problem, and not a comformation problem. The narrowness is "created" when the rider over-flexes and pulls on the rein. If a horse is trained to stretch into the bridle, this space will enlarge, because the topline will lift the atlas slightly with increasing tonus. In order to work properly the muscles of all mammals need a good supply of oxygen. We get that from the air via the lungs. The air pipe of the horse goes from the mouth/jaw along the bottom of the neck and then into the body and the lungs. Now, the air pipe is very much like a garden hose. It is fairly round and elastic but with a bouncy tone. When the neck is curled up, the air pipe is pressed against the spine at the base of the neck, and bent at the top of the neck. Now, what happens when you bend a garden hose? The horse needs to relax the poll in order to let the rest of the body work. Also, the other way around, imbalance or tension shows up as stiffness in the poll. The top of the neck of the horse consists of many small muscles, attaching to the skull and the 1st and 2nd vertebrae. These are the same muscles as your chiropractic mobilises when you are in back pain. These muscles are small and sensitive and there's a reason why your chiropractic has you lying down when he does the loosening. To correctly relax the poll area the head of the horse needs to hang "like a chandelier" as Charles deKunffy said, from the 1st vertebra. As it hangs there by it's own weight the nose of the horse is slightly in front of the perpendicular. The muscles that go from the 1st and 2nd vertebrae to the occipital protuberance of the skull (the very top of the head) have relaxed, but still have their natural tonus. No muscle force is needed to hold the nose down. Muscles that could hold the head back are attached at the jaw and the hyoid apparatus in the throat and go to the underside of the spine and the breast bone. These are also in total relaxation. Shut with a crank and a pad to soothe it. To hold the head back, either the horse has to lean on the riders hands, or he has to pull the head back himself. He does so by shortening the Scalenus Medius going between the top of the jaw to the middle of the neck and the Sterno-mandibularis that goes from the lower edge of the jaw to the breast bone. This pulls the jaw back and the middle of the neck forward. If the pulling back of the jaw shall not result in the horse opening his mouth, the horse needs to tense the Masseter (chewing muscle) or have his mouth shut by an snug noseband, such as the crank. Many top horses trained deep are fitted with crank nosebands plus gel-pads to stop the crank from chafing. This stops the horse from relaxing his jaw and chewing gently on the bit. The Sternohyoideus and Sternothyroideus go from the hyoid apparatus to the breast bone (sternum) and help pull the head back. The hyoid apparatus connects the tongue at the throat, and a pull on this muscle draws the tongue back and stiffens the neck at the jowl. For correct work and relaxation the tongue needs to relax, drop down and carry the bit properly. The spit glands at the rim of the back of the jaw, are squeezed between the atlas' wing and the rim of the jaw, if the jaw is pulled too far back. This can naturally hurt quite a bit. This is often blamed on poor conformation, a lack of space between the jaw and the atlas, either because the atlas is too big/low or the jaw too round. This can of course be true but it is very rare nowadays. Many times this problem is simply due to the horse being ridden behind the vertical, pulled in tight with force. Even in a horse with less than ideal conformation in this aspect, correct training in a longer and lower arched outline will "lift" the atlas and improve conformation.